Home Home Decor	Upgrade a Chandelier with new candle sleeves! Happy Tuesday, Friends! I hope you had a nice, long weekend celebrating Martin Luther King, Jr. Day. I’ve been meaning to share with you one of my tricks on how to upgrade a chandelier with new candle sleeves. And it’s as easy as a click away! I bought these matching chandeliers a few years ago from my favorite shop in Humeville, PA. It’s called Vintage Funk, which is owned and operated by the talented Tracy Miller. She finds the most unique pieces and paints them or reimagines them, and sells them for fantastic prices. When I found these beauties for around $80 each, I knew it was meant to be. I snatched them up on the spot. And the fact there were two of them made it more perfect! I had them put on long chain and plugs, then used them for my son’s engagement party. They hung from the outdoor trees at our lake house, aka Happy Hill. The chandeliers looked magical lit up the night of the engagement party. Sadly the bugs enjoyed them too. Is there such a thing as bug-free chandelier bulbs? I was seriously tempted to leave them up, but they are not waterproof and rain was on the way. I knew I wanted to use them permanently in my home, so once the wedding was over, I had them installed in our Butler’s Pantry. Here is the before picture of the lights. They are cool and interesting, but only held one light bulb each. (To see more of our Butler’s Pantry renovation see here: Butler&#8217;s Pantry Reveal! But you know me, I love a little sparkle. And these chandeliers have plenty! Just look at the lovely details! Glass beading and glass crystals. Alway a win in my book! The electrician hung these in the Butler’s Pantry. You can see the renovation was still in full swing at this point, but while the electrician was here installing under-the-counter lighting and a few outlets, we figured why not? And the extra wattage helped light the room during the remodel. Once the chandeliers were hung, I noticed the candle sleeves on each fixture were plastic. Because we planned to paint the cabinets a creamy taupe, I wanted the chandeliers to stand out against the lighter colored cabinets. A simple and inexpensive fix is to replace the candle sleeves. I love the cardboard sleeves with the gold, drippy candle effect. 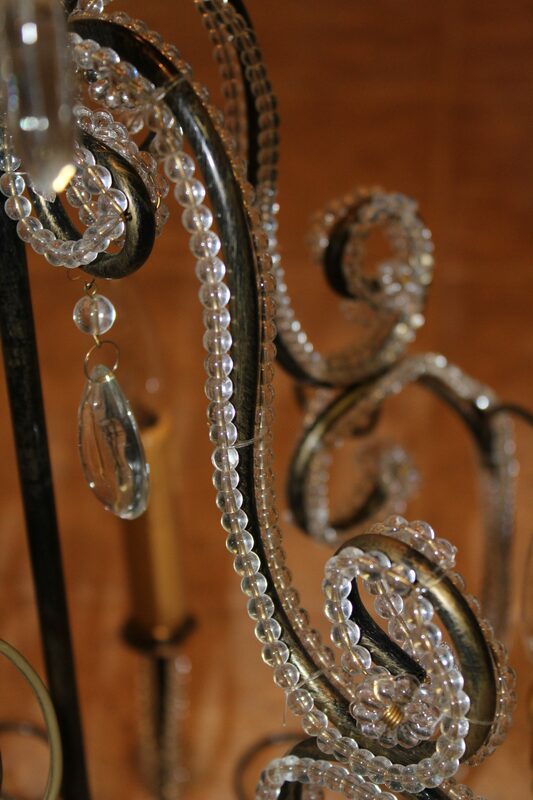 I’ve used them on several of my chandelier makeovers in the past. This time I ordered black ones. It’s a small change but makes a big impact in my world. It instantly makes them appear more substantial and high-end. To be fair, the side by side comparisons are hard to gauge without the benefit of the painted cabinets but trust me when I say the black sleeves look much better! If you have a chandelier you are looking to update, try changing out or painting your candle sleeves and see if it makes a difference to your light fixture! Once the cabinets were painted, I loved the chandeliers even more! I put the old plastic sleeves in my stash. Maybe I’ll reuse them someday. I think the looks of them could be improved by painting them black with a bit of gold paint on the drippy parts? Perhaps. For now, I’m pleased with the double crystal chandeliers. Sadly, they won’t be making further appearances at parties or weddings, but they were a great investment and brought pleasure to some of my favorite people in the world! Meanwhile we are LOVING our Butler’s Pantry! The only project left is to install the pull-out drawers in the former broom closet. We custom ordered them online to save money, but it takes 6-8 weeks, and they still aren’t in! I love finding unique chandeliers and using them in our homes. I still can’t believe these were around $80 each and boy have I gotten my money’s worth! Now I enjoy them each time I walk into the room. And while I plan to never leave this house, if I do, I’d be mighty tempted to take them with me! I’m currently working on organizing the storage area in our basement. Right now I’m saving on storage space by hanging my extra chandeliers from the ceiling. (No judging, okay?) My husband tore down my Treasure Room at the lake house so some of my goodies had to come to this house. The only thing that would make this better is if they all lit up at the same time. Way better.